Synthetic anion transporters (anionophores) have potential as biomedical research tools and therapeutics. However, the efficient and specific delivery of these highly lipophilic molecules to a target cell membrane is non-trivial. Here, we investigate the delivery of a powerful anionophore to artificial and cell membranes using a coiled-coil-based delivery system inspired by SNARE membrane fusion proteins. 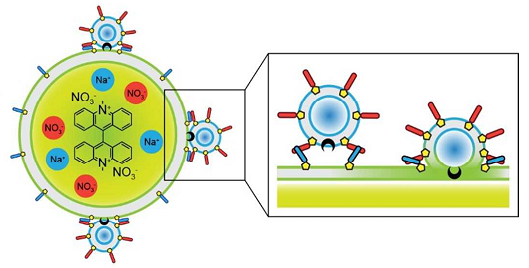 Incorporation of complementary lipopeptides into the lipid membranes of liposomes and cell-sized giant unilamellar vesicles (GUVs) facilitated the delivery of a powerful anionophore into GUVs, where its anion transport activity was monitored in real time by fluorescence microscopy. Similar results were achieved using live cells engineered to express a halide-sensitive fluorophore. We conclude that coiled-coil driven membrane fusion is a highly efficient system to deliver anionophores to target cell membranes.